Melksham Lions hosted a wonderful Easter Party for the children again this year – a now annual event – at the temporary homeless hostel here in Melksham. The children, and parents, and us Lions(!) 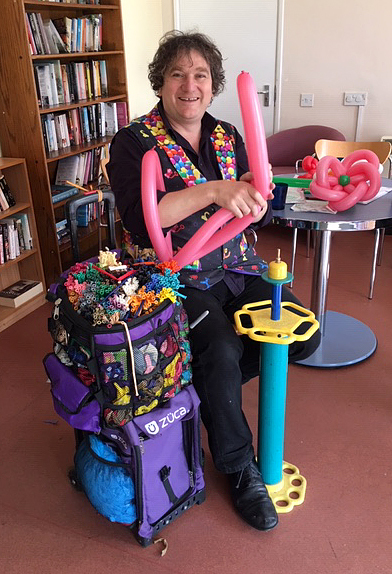 had a most eggcellent time (sorry) hunting down some well hidden eggs, and being thoroughly entertained by the amazing balloon creations twisted by local entertainer and balloon artist Dave Hickory, who generously gave up his time once again for us. 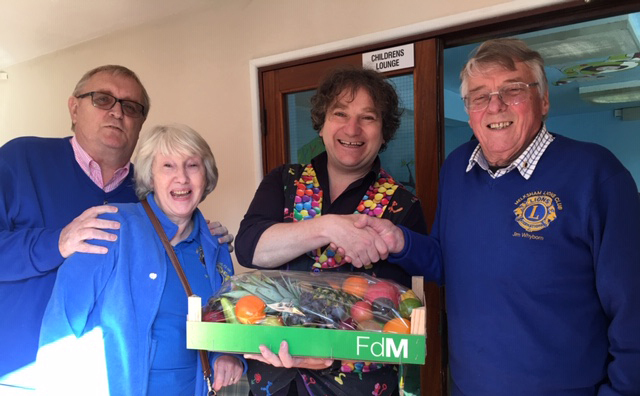 As a thank you for his time, Dave was presented with a rather delicious looking basket of fruit and veg, kindly donated by Neil Mortimer of Lovejoys. We are delighted to be able to provide some well needed respite for the families in need at the hostel; one of the many local community projects that we do our best to support. If you would like to find out more about how we raise funds and support your Melksham community, please get in touch and come along to one of our meetings. New members are always welcome; even if your spare time is limited, the more of us we are, the more we can distribute ourselves and share in the work. Come for a chat! All the details are on our Contact page.